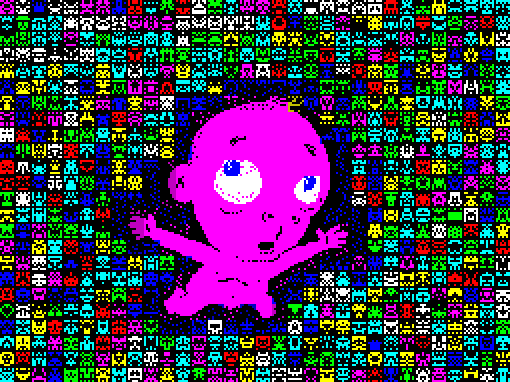 You play as either Mobius (or Pucky, if you prefer) and collect stationary Aliens (or Imps, if you so choose) that are distributed amongst a single screen set of platforms. These platforms are patrolled by baddies who follow fixed paths left and right. As well as walking about, you can (by standing on one of the abundant teleporters) jump to the platform above or below. Teleporting off the top of the screen moves you to the bottom platform and vice versa, and walking off the left/right of a platform wraps onto the other side of the screen – but you emerge on the level above/below respectively. Thus you have many many ways of moving between platforms. Initially there appears to be very little challenge in EFMB, with each stage feeling much the same but with a few extra baddies to (easily) avoid. And then, around stage 6 things start to get challenging. Very challenging. 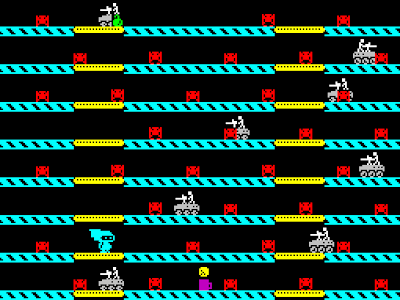 Some of the baddies have stopped patrolling and move towards you if you are on their platform – whilst others start using the shortcuts off the edge of the screen. 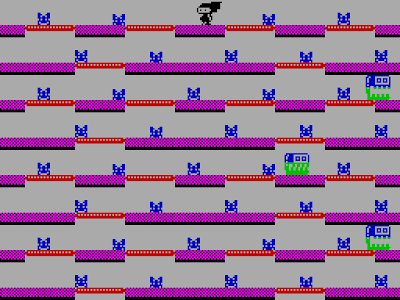 Also collecting an alien (or imp) carries the chance of it turning into a bomb that will detonate a few seconds later (by which time had better not still be on that platform) – and from time to time you must avoid the deadly attribute snake which rolls down the screen one platform at a time. Chaos and twitch gamplay ensues. To somewhat even the odds you can collect the cup of tea and a biscuit that occasionally appears rendering you invincible for a short while - Dave Hughes obviosuly shares my own feelings towards the restorative powers of a well timed cuppa. Rather than having lives, your progress is tracked through which of the ten stages you are on – with death meaning you are put back to retry the previous stage. This works as a great adaptive difficulty level – as you improve at the game you get further through – so you end up (typically) oscillating between a few stages that tax you. 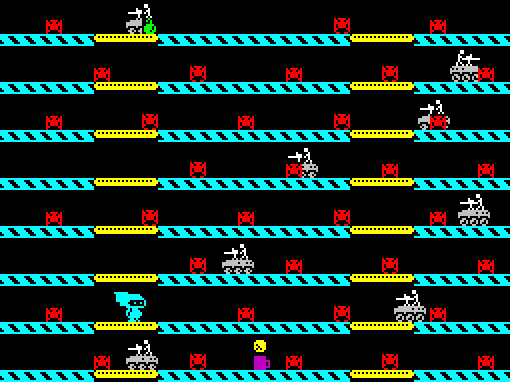 But here's the clever bit... the levels are pseudorandom: the layout, alien sprites, colours and floor graphics are varied – so even the same numbered stage can look and feel quite different. This simple design choice makes the stages feel fresh (and sometimes rather bizarrely coloured) each time you play. 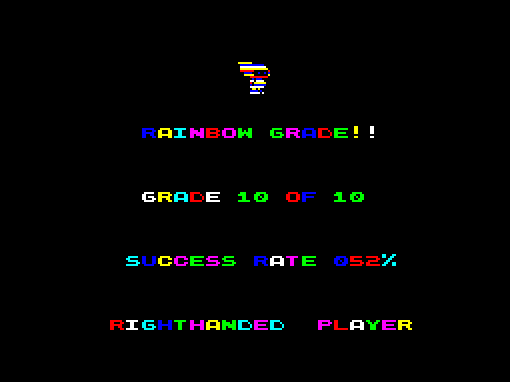 Add to this an amusing choice of language and a great set of (non-random) sprites (with Mobius, Pucky and the Baddies all being very nicely drawn and animated) - plus some nice programming touches with rainbow colours and a good front end... and you have a delightful arcade game that oozes one-more-go appeal. 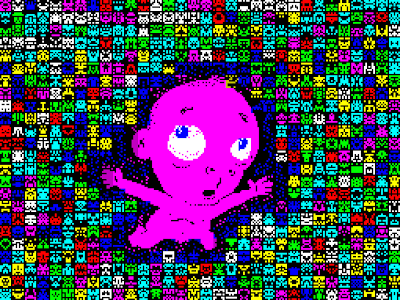 Upon initially running Endless Forms Most Beautiful you are asked for your favourite four letter word (presumably to generate a random number seed for all the procedurally generated choices in the game) – and despite initially feeling like the games is a programming exercise in randomization rather than a game (hate), EFMB will soon win you over and your four letter word will become love. Because 'hooked' has more than four letters.